Colony state and regulation of pollen foraging in the honey bee, Apis mellifera L.
To place social insect foraging behavior within an evolutionary context, it is necessary to establish relationships between individual foraging decisions and parameters influencing colony fitness. 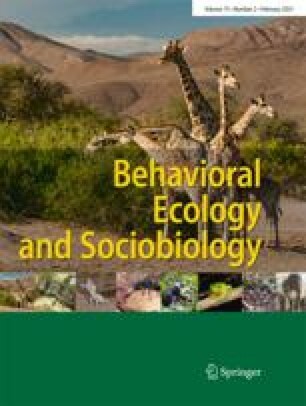 To address this problem, we examined interactions between individual foraging behavior and pollen storage levels in the honey bee, Apis mellifera L. Colonies responded to low pollen storage conditions by increasing pollen intake rates 54% relative to high pollen storage conditions, demonstrating a direct relationship between pollen storage levels and foraging effort. Approximately 80% of the difference in pollen intake rates was accounted for by variation in individual foraging effort, via changes in foraging activity and individual pollen load size. An additional 20% resulted from changes in the proportion of the foraging population collecting pollen. Under both high and low pollen storage treatments, colonies returned pollen storage levels to pre-experimental levels within 16 days, suggesting that honey bees regulate pollen storage levels around a homeostatic set point. We also found a direct relationship between pollen storage levels and colony brood production, demonstrating the potential for cumulative changes in individual foraging decisions to affect colony fitness.